State Sen. Steve Russell’s quest to make Oklahoma opt out on federal hate crime legislation based on sexual orientation or gender identity is a repugnant crusade that does nothing more than pander to intolerant, right-wing religious folks here. Unfortunately, Russell, pictured right, has plenty of support in the legislature. Last week, the Oklahoma Senate on a 39-6 vote passed SB 1965, a bill that was amended to include the opt-out provision. 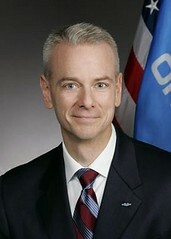 Russell, an Oklahoma City Republican, offered the amendment. He had previously said he would propose the legislation because he was worried religious leaders could violate the law by speaking out against particular lifestyles. The federal government should not be creating a special class of people, and that is just what they did when they passed and signed this bill. All crimes against another person have some level of hate in them, and people can be assured that our laws that protect people against crimes such as murder are sufficient to protect everyone. Russell’s argument is disingenuous. It ignores the fact that gay people can face discrimination and even violence specifically because of their sexual orientation. The bill specifically excludes protection for sexual orientation and gender identity, two categories that were added recently to federal hate crimes law. It doesn’t exclude race, color, religion, ancestry, national origin or disability. Russell’s amendment is itself an act of hate and intolerance that tries to legalize and codify bigotry. What is the purpose of the bill, except to echo the intolerance and hatefulness of the religious right? No religious leader here or elsewhere in the country is going to get in trouble for speaking out against homosexuality. That’s just absurd. This bill is nothing more than an attack on a specific group of people. It’s blatant discrimination. Let’s be clear. The federal hates crimes legislation that included sexual orientation and gender identity was a major step forward in protecting a group of people often marginalized in our culture. It was long overdue. Senator Russell’s bill is truly terrifying in its implications. This legislation sends the message that violence against LGBT Oklahomans is acceptable. It also sets a chilling precedent that Oklahoma will only enforce certain federal laws and cooperate only with selected federal agencies. We believe this unconstitutional and blatantly discriminatory bill will harm all Oklahomans, regardless of their identity and regardless of whether they are victims of hate crimes. The bill’s constitutionality is a real question. Can Oklahoma, a state that receives more in federal dollars than it pays in, just ignore national laws? I don’t think so. The state is heavily dependent on the federal government for its very viability. If the bill makes it to Gov. Brad Henry’s desk, it should be vetoed. Russell is continuing the gay bashing tradition well established here by local politicians such as U.S Sens. Tom Coburn and Jim Inhofe and, of course, state Rep. Sally Kern, who once claimed homosexuality was a greater threat to the country than terrorism. These politicians damage the state’s image and make Oklahoma seem like a backwards, hateful place. There’s a real cost here in terms of economic development.